President Donald Trump and Steve Bannon’s relationship has endured peaks and valleys in the past year and a half, not to mention the past day and a half. A low point has now came in the form of a controversial book in which Bannon, a former White House chief strategist, made what Trump’s lawyers called “disparaging” comments about the president and his family. Here is a look back at the long and complicated relationship between the two men. Bannon first met Trump through David Bossie, the head of conservative group Citizens United, Bannon said in a later interview with then-CBS anchor Charlie Rose. Trump announced that Bannon had joined the campaign as the new CEO. The president’s statement also announced the addition of Kellyanne Conway as the campaign manager. 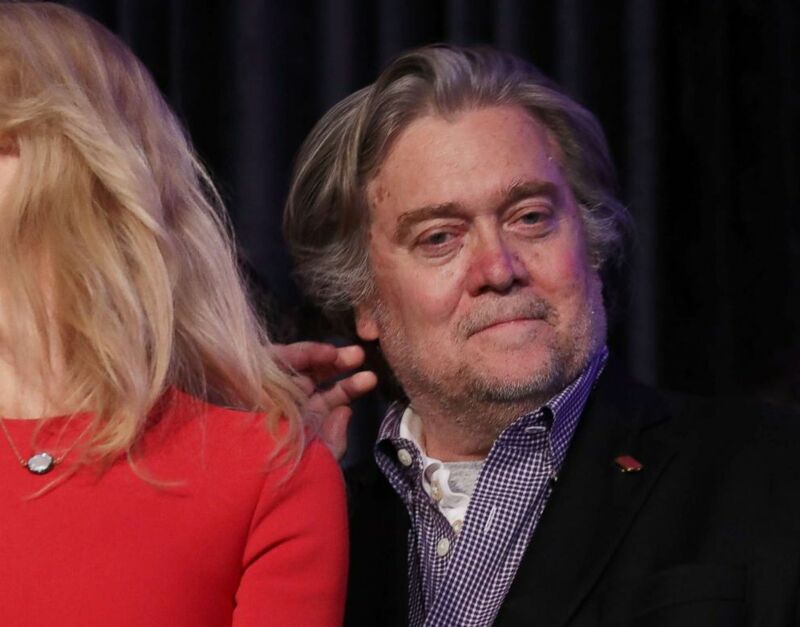 Republican president-elect Donald Trump's campaign manager, Kellyanne Conway, and Trump campaign CEO Stephen Bannon stand on stage during the election night event at the New York Hilton Midtown, Nov. 9, 2016. Trump brought on Bannon because he respected his instincts and successes, a senior campaign source told ABC News at the time. Trump liked that Bannon was a "high energy person" with "big ideas," the source said. Bannon spoke to the media rarely during the campaign, with one of the few interviews taking place by chance. "Right now he really, really thinks he's going to win," Bannon said to CNN's Brian Stelter and Brooke Baldwin, who ran into him at the Las Vegas airport before the third presidential debate in October 2016. "What the media misses is the amount of anger that's out there. Trump didn't create that," Bannon said. Trump created the role of chief strategist and senior counselor to the president for Bannon after their electoral win. A news release announcing the appointments of both Bannon and Reince Priebus, as the president's chief of staff, said both would work "as equal partners to transform the federal government" and to assist then-Vice President-elect Mike Pence in his new role as transition chairman. An executive memorandum signed by Trump gave Bannon the authority to participate in National Security Council principals committee meetings. Bannon was removed from his role with the National Security Council, according to a senior administration official. He had no objections to his removal, a source familiar with the decision told ABC News. He was still allowed to attend some NSC meetings as a participant, just not as a principal. "He was there to babysit [now-former national security adviser Michael] Flynn, to watch him as he deoperationalized the NSC from [Obama-era national security adviser Susan] Rice," the source said at the time. "Mission done." Trump had some choice words about Bannon during an interview with New York Post columnist Michael Goodwin that had some people reading tea leaves for insight into their relationship. “I am my own strategist,” Trump said. 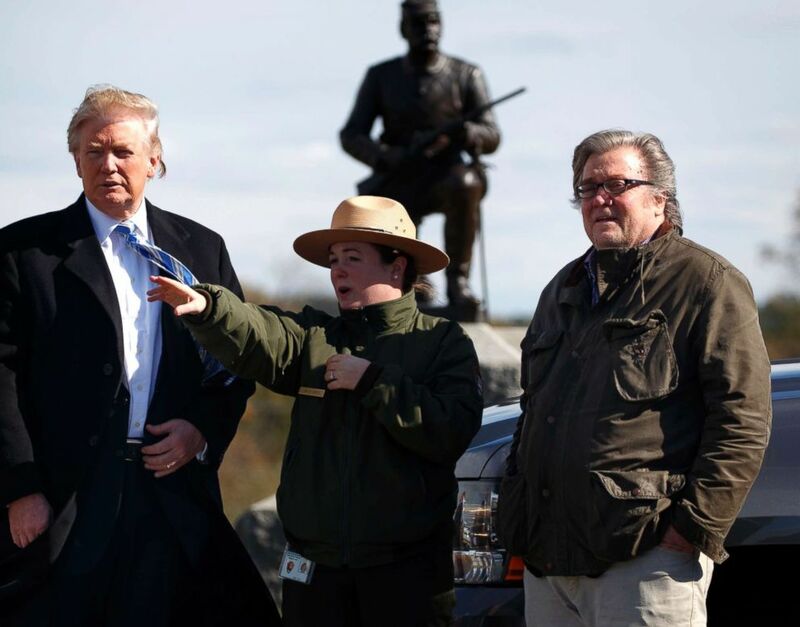 Park ranger Caitlin Kostic gives a tour near the high-water mark of the Confederacy at Gettysburg National Military Park to Republican presidential candidate Donald Trump, left, and campaign CEO Steve Bannon, Oct. 22, 2016, in Gettysburg, Pa.
After the violent clashes in Charlottesville, Virginia, the president fielded questions about his response to the protests and also spoke about Bannon, whom many associate with the sometimes perceived racist views touted by Breitbart News, where Bannon worked before (and after) his time in the White House. "I like Mr. Bannon. He's a friend of mine. But Mr. Bannon came on very late. You know that. I went through 17 senators, governors, and I won all the primaries. Mr. Bannon came on very much later than that," Trump said before adding, "but we'll see what happens with Mr. Bannon." 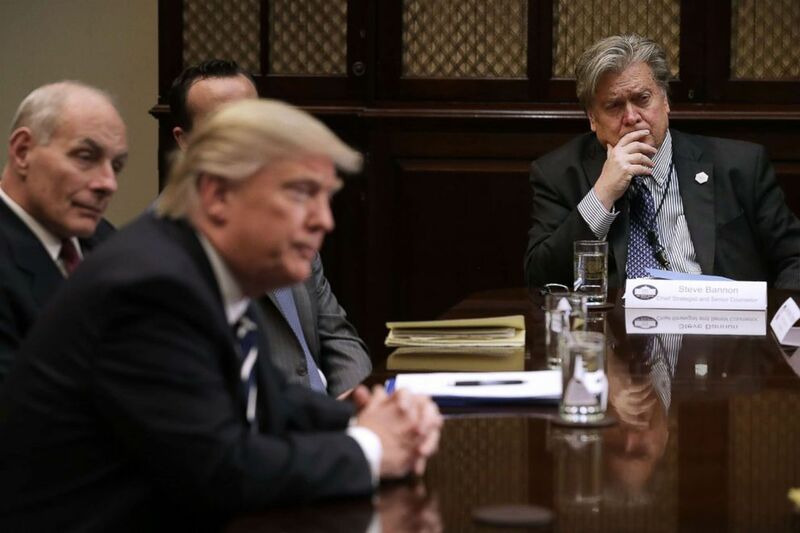 Trump had grown increasingly frustrated with Bannon in recent weeks, according to one senior White House official, and dissatisfaction from within Trump's inner circle was compounded by Bannon’s interview in American Prospect magazine, which was published Aug. 16. Bannon seemed to undercut the president on North Korea in the interview. "There's no military solution here, they got us," Bannon told the magazine. Bannon was forced to resign from his position at the White House on Friday Aug. 18, nearly seven months into the administration. A source close to Trump told ABC News it was ultimately the president's decision to dismiss Bannon. The message was delivered from White House chief of state John Kelly, who was with the president at his golf resort in Bedminster, New Jersey. Bannon was at the White House when he received the call that it was time for him to leave. "We are grateful for his service and wish him the best," White House press secretary Sarah Sanders said in a statement to ABC News. Bannon had submitted a letter of resignation to the president earlier in the month with an effective date of Monday, Aug. 14, according to sources close to both Bannon and Trump. But amid the fallout from Trump's controversial response to the violence in Charlottesville, days earlier, Bannon's Aug. 14 resignation date came and went as the president considered Bannon's future, sources said. Meanwhile, several top Trump aides continued to make the case that he needed to go. White House Chief Strategist Steve Bannon, right, listens to President Donald Trump at the beginning of a meeting with government cyber security experts in the Roosevelt Room at the White House Jan. 31, 2017. Marking the first time that Trump had tweeted about Bannon directly since he joined the campaign, the president posted two tweets about Bannon’s departure and future role at Breitbart News. “I want to thank Steve Bannon for his service. He came to the campaign during my run against Crooked Hillary Clinton - it was great! Thanks S,” Trump wrote in the first tweet. “Steve Bannon will be a tough and smart new voice at @BreitbartNews...maybe even better than ever before. Fake News needs the competition!” he wrote in the second. Bannon sat down with CBS's Rose in the biggest interview since his departure from the White House, discussing a wide range of issues. "I think I'm a street fighter. And by the way, I think that's why Donald Trump and I get along so well. Donald Trump's a fighter. Great counter puncher. Great counter puncher. He's a fighter," Bannon said of their similarities. In the same interview, Bannon said the firing of FBI Director James Comey was the biggest mistake in "modern political history." During the daily press briefing, hours before the full interview aired, when asked whether Trump was still talking to Bannon, press secretary Sanders said, "I know they’ve had one conversation but I don’t think anything beyond that since he left." Bannon spoke at a lunch in Hong Kong Sept. 12, saying at that point he still spoke with the president every two to three days, the Wall Street Journal reported. “Some of the people that he may be looking at, I’m going to see if we talk him out of that, because, frankly, they’re great people," Trump added. Bannon reportedly called Trump and advised him to be more aggressive about slowing down special counsel Robert Mueller's investigation into whether Trump’s campaign colluded with the Russians, according to three sources close to Bannon. Bannon had been advocating for "a much more aggressive legal approach, short of firing Mueller," a source close to Bannon told ABC News. ABC News reached out to Bannon at the time, and he declined to comment. Sanders said at the daily press briefing that the president did not support defunding of the special counsel. She also added that he was happy with his legal team. “I’m not sure what we would push back against since they’ve just come up with ways and shown more and more that there’s no connection between the Trump campaign and collusion with Russia,” Sanders said. 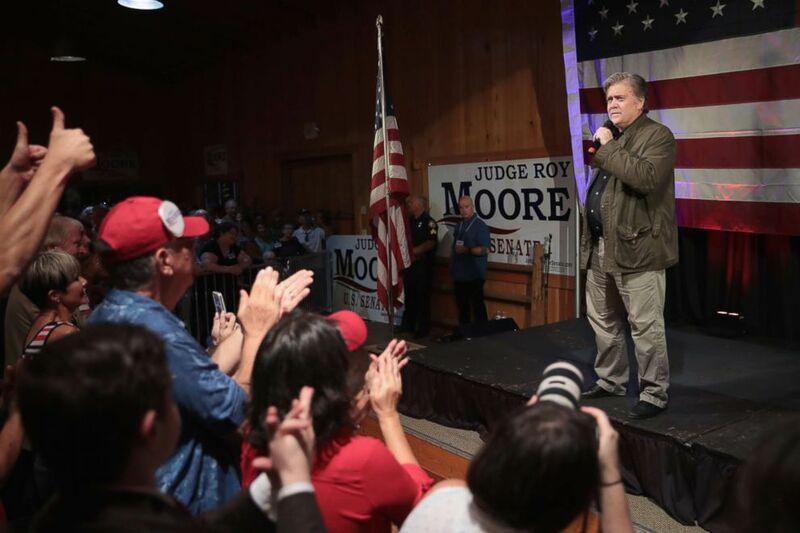 Former advisor to President Donald Trump and executive chairman of Breitbart News, Steve Bannon, speaks at a campaign event for Republican candidate for the U.S. Senate in Alabama Roy Moore on Sept. 25, 2017 in Fairhope, Alabama. When asked whether his relationship with Bannon would influence the president’s stance on Roy Moore, the Republican senate candidate in Alabama who had been accused of assaulting and harassing a number of young women decades earlier, Sanders said it would not. “The president doesn’t have an allegiance to Steve Bannon. The President has an allegiance to the people of this country and nothing else,” Sanders said at the daily press briefing, adding that she was not “aware of” any conversations Trump had with Bannon about the Moore race. Excerpts from a book about the Trump administration were published, including some disparaging comments Bannon made about the Trump team and family. Trump issued a fiery and lengthy statement in response, slamming Bannon and dismissing his involvement in the campaign. “Steve Bannon has nothing to do with me or my presidency. When he was fired, he not only lost his job, he lost his mind. Steve was a staffer who worked for me after I had already won the nomination by defeating seventeen candidates, often described as the most talented field ever assembled in the Republican Party,” the statement read. “Now that he is on his own, Steve is learning that winning isn’t as easy as I make it look. Steve had very little to do with our historic victory, which was delivered by the forgotten men and women of this country. Yet Steve had everything to do with the loss of a Senate seat in Alabama held for more than thirty years by Republicans. Steve doesn’t represent my base—he’s only in it for himself,” the statement continued. In the daily briefing, Sanders said she believed the last time the pair spoke was in "the first part of December." Bannon spoke out during a call-in segment of the “Breitbart News Tonight” radio show on Sirius XM, sharing kind words about the president. “The president of the United States is a great man,” Bannon said. “You know I support him day in and day out. Trump’s legal team issued cease-and-desist letters to Bannon -- demanding that he stop making disparaging comments about the president and his family -- and the author of the book, Michael Wolff, and his publisher in an attempt to stop publication. When Trump was asked whether Bannon betrayed him with his comments in the book, Trump pointed to the favorable comments Bannon had made the night before. “I don’t know, he called me a great man last night so he obviously changed his tune pretty quick,” Trump said. "I authorized Zero access to White House (actually turned him down many times) for author of phony book! I never spoke to him for book. Full of lies, misrepresentations and sources that don’t exist. Look at this guy’s past and watch what happens to him and Sloppy Steve!" Trump wrote in the first tweet. In the second, he referenced a family of wealthy Republican donors -- the Mercers – who have pulled their financial support from Bannon, as ABC News reported on Jan. 4. "The Mercer Family recently dumped the leaker known as Sloppy Steve Bannon. Smart!" the other tweet read.